After news broke that Nene Leakes was quitting The Real Housewives of Atlanta, fans of the series wondered if the show would be able to survive without the queen moose. Thankfully, Bravo has announced that Sheree Whitfield will be joining the cast, and she's already bringing the messiness! Ms. "Who Gon Check Me Boo?" was filming with the ladies on Friday night at Cynthia Bailey's eyewear launch party. Sheree reportedly got into with Kenya Moore already, with some sources stating the ladies were "throwing water on each other" LMAO! You know Nene is somewhere flipping that dry blonde wig, pretending to be completely #unbothered by this new shift in the show. But with Sheree back on the show, Nene is like a distant memory (or a bad dream). Her negative energy will not be missed! To make things even better, Marlo Hampton also returns as a guest of the show. Last we heard from Marlo, she and Nene were on the outs (isn't Nene on the outs with everyone in her life at some point?). 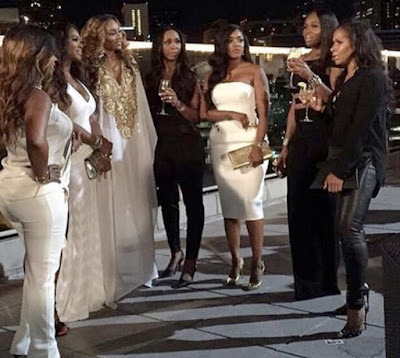 Will you be watching Sheree and Marlo on the new season of Real Housewives of Atlanta?